This is a sample stock analysis, the type of feature that we regularly share with subscribers at http://www.manifestinvesting.com Stocks selected during our FREE/public monthly webcasts known as our Round Table have outperformed the market (Wilshire 5000) for over 5 years. FREE test drives and trial subscriptions available. Subscribers may remember our explorations and discussions inspired by Charles Carlson about the avoidance of being “stubborn” in investing. (See Rules of Engagement , December 2008) His Rule #8 was “Have the Courage to Act on Your Conviction, BUT, Do Not Confuse Conviction with Stubbornness.” We might also remind ourselves about the conviction displayed by David Gardner and his exemplary performance for the Motley Fool Stock Advisor newsletter. (First Break The Rules , April 2016) His mettle was definitely tested with Amazon, Netflix and others while remaining steadfast on the path to exceptional returns. Which brings us to one of the Motley Fool Faves … and our May 2016 selection of Under Armour. Apparel retail is never easy. Entering the competitive fray with the likes of Nike and Adidas to deliver shoes could definitely be characterized as kicking sand on an 800-lb gorilla or two. On top of that, a confusing whirlwind of ticker changes and voting rights “innovation” lead to a confusing and uncertain impression that scatters the institutional investors like screaming “Fire!” in a movie theater. The ultimate result is the price swoon shown in the accompanying figure. The Manifest Investing sales growth forecast for UAA is 11.2%. Value Line has a 3-5 year sales growth forecast of 24%. Morningstar sees growth in the 11-12% for 2017, a “sharp deceleration” from 22% in 2016. S&P still sees 18% earnings growth going forward. We’re using 6.7% for the projected net margin. The average net margin has been 6.3% for the period 2009-2016. Value Line has a 3-5 year projected net margin of 12.7%. Under Armour is clearly in the throes of a life cycle profitability speed bump. The median P/E for the period 2009-2017 is 43.2×. Value Line has a projected average P/E of 35.0×. We’re using approximately 30x for the projected average P/E. At the time of selection (2/7/2017), the stock price is $20.47, the projected annual return is 11-12%. The quality RANKING is 95 (Excellent) and the financial strength rating is 91 (A+). We mentioned David Gardner and his loyalty to some of his more turbulent selections over the years. As we noted in the article, many of his best performers encountered extreme speed bumps. And it was his brother, Tom Gardner, who selected Under Armour on 9/20/2013 at $19.47. Our experience has been that speed bumps are inevitable during the life of all companies, even the bluest chips. One often occurs after the expiration of the IPO restricted period. A second often occurs after emerging into consistent positive profitability and I think we’re seeing this here. We’ll take a look at a 45-year analysis of Nike to illustrate and make mettle testing manifest. I’m not sure why I hadn’t done this yet. We did take a 20-year look at CSX (CSX) a while ago to examine long cycles. But this is for a different reason. I remember a 30-year Stock Selection Guide article that was contributed to the Better Investing BITS newsletter by Diane Graese many years ago. In the article, Diane shared a very long term perspective on Dana Corporation, complete with all of its cyclical warts and wrinkles. It’s time to go back. You can’t do this (meaningfully and with as much relevance) for companies that have a lot of M&A activity in their history. 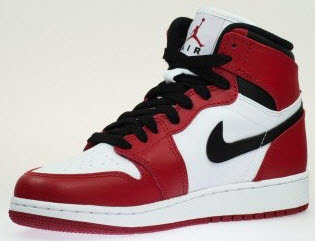 But in this case, Nike is relatively clean in this regard. Although it has evolved, Nike has been basically the same company with a fairly steady capital structure and product portfolio for many years. Nike (NKE): Business Model Analysis (1984-2020). Sales growth has been fairly steady for an apparel retailer over the years, checking in at low double digits since inception. The sales growth trend and forecast for 2004-2018 is closer to 8%. The emergent EPS point is clearly shown for the company in the mid-1980s. Stock price? Stock price follows earnings. Rinse. Repeat. Nike shareholders are smiling and wouldn’t be surprised to be owned by Berkshire Hathaway some time soon with a chart like this. Nike (NKE): Profitability as measured by Net Margin (1984-2020). This is a powerful long term trend. 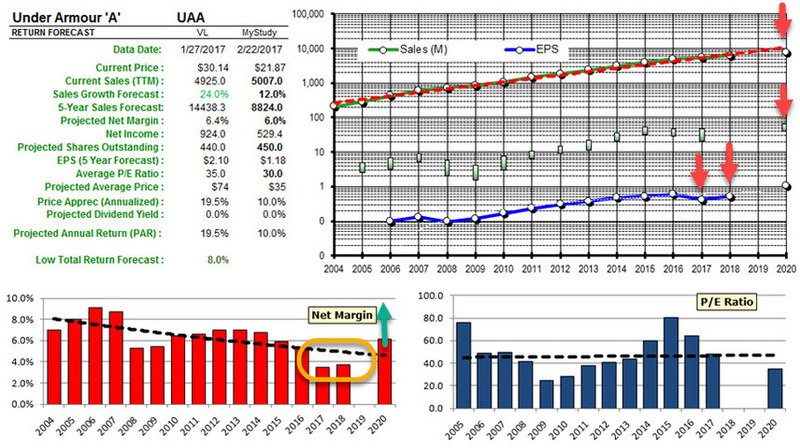 The moment that we notice — that I believe has context with respect to Under Armour — is the 1998 downdraft in profitability. Global recessionary pressures at the time, in combination with diminishing returns from Peak Air Jordan, came together in a perfect storm that resulted in some optimization, investment in infrastructure and product portfolio shuffling. The result was a “speed bump” in earnings that impacted stock price and generated something of a stock price plateau for a few years. But persistent year-after-year gains in profitability and earnings wears down the most steadfast rhino over time. This chart, as part of our Management Report Card for any company, is exemplary when it comes to Nike. Nike (NKE): Valuation (1984-2020). The P/E ratio languished during the early years (1984-1988) until the EPS stabilized “north” of 0%. Nike never saw the types of P/E ratios that a company like Under Armour has exhibited — but a P/E ratio in the high teens is fairly easily defended. The P/E ratio trend will often track on a trajectory similar to the profitability and that seems to be the case with Nike. 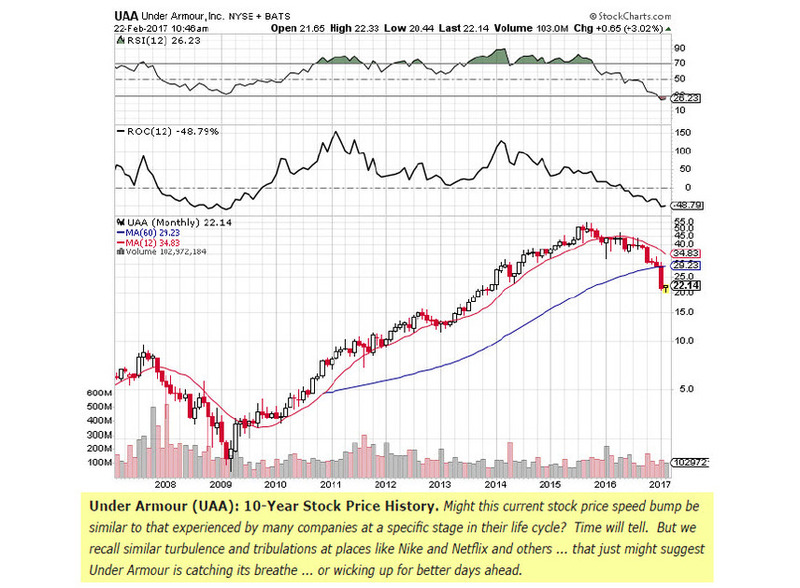 Under Armour (UAA): Update. Growth expectations have been slashed for 2017 and perhaps, 2018. The impact on 2017, 2018 and the 3-5 year forecast has been reflected here. Bottom line? I really do believe that Under Armour is going through the same type of speed bump experienced by Nike at the 10-15 year mark. Kevin Plank has aggressively grown the company, the products are outstanding and the customers are loyal. Under the reduced expectations discussed by Value Line (1/31/2017) the return forecast is now low double digits. But with the average stock at 5-6% and the prospect (long term) of beating the sales and profitability expectations — even while the average P/E ratio moderates — this could be rewarding for the most adventuresome out there with appropriate time horizons.